Derby County midfielder Will Hughes has been ruled out for six months with a knee injury. The 20-year-old damaged anterior cruciate ligaments in his right knee in the opening game of the Championship season against Bolton on Saturday. Hughes got his foot caught in the turf and was taken off on a stretcher after 33 minutes of the 0-0 draw. Manager Paul Clement told BBC Radio Derby: "He is still young and has fantastic career ahead of him." 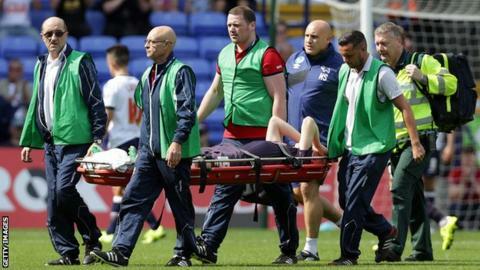 England Under-21 international Hughes had surgery on Tuesday and is set to be sidelined until February. "In the past these injuries could have been career threatening," Clement added. "Will can learn from him and would have seen first hand what George has been through. "He will know what to expect. Will is obviously very sad but he can come back stronger and come back mentally stronger." Hughes has played 138 games for the Rams since making his debut as a 16-year-old in November 2011.